"From Sole Learning to Soul Learning"
Is it effective or even possible to teach an introductory course in religious studies that not only provides first-year university students with the fundamental vocabulary, concepts, and critical tools of religious inquiry but also invites and stimulates the transformation of the religious imagination? In what kind of teaching and learning method could the process of personal transformation occur and how might one assess it? These are the questions that led to an experiment in teaching religion the objective of which was to prepare beginning students for the academic approach to religion and, at the same time, transmit the experience of learning as an embodied process that engages personal narrative within a community context. This essay is based on a three-year project that has made considerable progress in meeting these goals and answering these questions. "Pedagogies of Interpretation in Educating Clergy"
In this essay the authors describe how four seminary educators pedagogically engage students in practices of interpretation and explore how the variations in their teaching practices shape the critical thinking they seek to cultivate in their students. The piece is excerpted from an ethnographic study of Jewish and Christian seminary educator teaching practices sponsored by the Carnegie Foundation for the Advancement of Teaching (Educating Clergy: Teaching Practices and Pastoral Imagination, Jossey-Bass Publishers, November 2005). The study explores how the classroom- and community-based teaching practices of seminary educators prepare students to integrate professional knowledge and skill with moral integrity and religious commitment in professional practice. In addition to the pedagogies of interpretation explicated here, we observed pedagogies that engage students in practices of formation, contextualization, and performance. Attention is also given in the study to the influence of pedagogies embedded in the traditions of seminary education on student learning and to the cultivation of spiritual and professional practices beyond the classroom in community worship and through strategies of field education and small groups. "Teaching for Transformation: Insights from Fiji, India, South Africa, and Jamaica"
How can teaching and living abroad impact our teaching in North America? This article explores how what I do teaching religion and ethics to undergraduates at Texas Christian University has been influenced by twelve years of teaching in the two-thirds world. It is structured in terms of three insights that correlate with what I call the past, present, and future dimensions of ethics, respectively. First, we need to begin where our students are – taking their contexts seriously. Second, we should expose them to the moral and religious experience of others, so that they might be pulled by those others toward broader perspectives. Third, we should challenge them to envision new ways of living, including new self-understandings and images of society. Drawing on examples of how I use these insights in courses at TCU, I contend that we can best promote transformation in our students by holding these three insights in creative tension. "Experiencing the Other as the Self: Cultural Diversity Courses as Liberating Praxis"
In response to our increasingly global and multicultural world, undergraduate degree plans have come to include courses, which meet the Diversity requirement. While diversity may have a variety of definitions, clearly the educational institution believes that all students earning a degree should complete course work that exposes them to cultures not their own. Courses that fulfill Diversity requirements often include "Introduction to World Religions," among others. Even a traditional-style teaching of such a course will accomplish a certain degree of broadening of students' perspectives. The risk, however, is that at the end of the course the students are simply better informed about sets of people whom they would still objectify as the other. This article describes an experiential method of teaching which enables students to begin to change their consciousness, as well as their body of information, by learning to experience the other as self. The author calls this the identification/participation method. "Towards a Non-Essentialist Pedagogy of "Islam""
Traversing a rock-strewn terrain of essentialist methodologies historically employed for teaching Islam, the author espouses a non-Essentialist pedagogy that combines critical reflection, analysis of historical methods, and development of an appreciation for alternative notions about Islam and global interdependence. In this essay the author contends that teaching Islam ought to avoid our and their language and instead aim at helping students think in critically reflective, creative, and relational ways so that they might learn to "think of civilizations as transformative, reflexive, and fluid entities." "On the Teaching of Islam at Luther Seminary"
In a brief essay originally presented as part of a panel discussion with Christian and Muslim teachers of Islam in the university setting, the author describes the distinctive characteristics of the Islamic Studies Program at Luther Seminary (St. Paul, Minnesota). While the program allows Islamic studies "majors" to earn a degree (M.A. or M.Th.) or certificate in the field, it also aims to be accessible to students in all degree and non-degree programs of the seminary. The author names three sets of issues that result from the determination, at one and the same time, to be faithful Christian theologians and to honor Muslims and their traditions: the hermeneutical issues arising when Christians attempt to read Muslims' sacred scripture; the challenges of developing a dialogical theology in relation to Islam; and questions about the character and practice of Christian witness in a world shared with Muslims, themselves called to da'wah. "Teaching the Dance of World Religions"
In the past decade, critical scholars such as Ronald Grimes and Talal Asad stated that there is a need to recognize the cultural and spiritual dimensions of religion, especially in an age of pluralism. While they call for an increased knowledge and application of techniques from anthropology, ethnology, and performance studies, what actually happens when one teaches from this perspective? As a religious scholar with training in dance anthropology, I created a class on World Religions that was based on these principles. Taught at interfaith and ecumenical seminaries, as well as a California university, the results were interesting, varied, and insightful. This paper discusses the problems, questions, and positive results of these classes, offering a base model for teaching religion in a multicultural, pluralistic age. "Thinking Out Loud about Teaching Bioethics: A Contribution from the Edge"
Teaching bioethics might be likened to a rollercoaster ride of twists, turns, and dips that invite teachers and students to experience something of their own edges of fear and comfort. Here the author provides readers with a glimpse into her distinctive approach to teaching bioethics that encourages students to move beyond boundaries of personal comfort zones by willfully transgressing traditional or comfortable boundaries. The essay describes how this is accomplished through a variety of methods – provocative readings, classroom discussion, student response papers, and student ethics committees. The author contends that teaching bioethics ought to include critical pedagogical methods and an alertness for real-life intersections of science and ethics. Teaching bioethics can be a subversive activity that encourages students and teachers to engage in making life morally livable. "Preachers and Prophets: Using Film to Teach American Religious History"
Can students learn religious history from movies? While using film as text is likely to attract students' interest, will such a course be able to negotiate the complex intertwining of film with religion and history to provide students with more than mere entertainment? Will students respond to a challenge to move beyond a movie's surface visual experience to address the core lessons history posits: it's not always been this way, we are the product of what has come before us, I/we are being called to change? This article discusses one attempt to answer these questions and examines both the opportunities and difficulties of using movies to teach religious history. 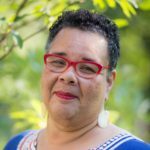 "Confronting Ghosts of the Christ-Haunted South: Teaching Theology through Teaching Story Lawanda Smith"
Southern fiction writer Flannery O'Connor once characterized the South as Christ-haunted, and having taught in the South for eight years now, I have come to appreciate O'Connor's evaluation. Most of the students I encounter understand one predominant way to practice Christian faith: assent to propositional theology. Most of them either accept this view uncritically or reject Christian thought completely, seeing it as stifling. My goal is to introduce the diversity of Christian thought in a non-threatening way. Knowing story's potential to draw people into community as well as to transform consciousness, I believe story offers a less threatening way to invite students to explore diversity. This paper describes a course titled "Christian Thought and Contemporary Short Fiction," a course I developed to try to introduce students to a variety of ways to understand Christian thought and practice Christian faith. The paper describes development and facilitation of the course, including student responses to the course content and evaluation of the course. "Teaching Religion in Its Contemporary Contexts: A Case Study"
After the disheartening results of an informal investigation of content knowledge and reading comprehension among her students, the author ponders the implications for her teaching objectives. What are we, as educators in religious studies, really teaching and how are we doing it? How are we accommodating students with less traditionally honed academic skills without diminishing content? She describes her experiments with several new teaching strategies for enhancing student learning by helping them improve basic skills, develop cultural literacy, and relate course content to their personal experience. This discussion of the goals and methods of teaching biblical literature is an edited transcription of a panel recorded at the 2010 Society for Biblical Literature conference. The panelists were asked to reflect on William Placher’s recently published theological commentary on Mark as an example or test case of how one might use a biblical commentary as a classroom resource. Karl Barth wrote that insofar as their usefulness to pastors goes, most modern commentaries are “no commentary at all, but merely the first step toward a commentary.” What value might commentaries have for our students, whether future pastors or undergraduates in the liberal arts? While the panel consisted of teachers of undergraduates as well as theological students, the emphasis of the presentations and subsequent discussion focused mostly on theological formation. "As If Religion Matters: Teaching the Introductory Course as if it Does"
This essay chronicles the academic odyssey of a young professor who sets out to revise the department's Introduction to Religion course only to realize that she must first clarify her vocational commitments before she can create a teachable course. She is convinced through working with many students who express disdain or even hostility toward the subject matter that she wants to model a relationship to the subject matter that says religion matters, but is uncertain how to do this. After an autobiographical foray into her academic upbringing in active learning, the author articulates four values to model in her teaching: personal relevance, academic responsibility, ethics, and community. The author then engages current scholarship in active learning, and narrates the process of translating those four values into concrete course goals and particular assignments. The essay concludes with an assessment of teaching the revised course. "On Qualifying Religious Literacy: Recent Debates on Higher Education and Religious Studies in Japan"
This article describes and analyzes controversies in Japan brought about by an intercollegiate educational project on religion. The project team, consisting of selected members of the Japanese Association for Religious Studies and the Japanese Association for the Study of Religion and Society, has been planning a new system for qualifying undergraduates as "specialists in religious cultures" (sh ky -bunkasi). It is anticipated that students with this qualification will be engaged in various occupations that require knowledge of different cultures. The project reflects an increased awareness that the academic study of religion should play a social role and be recognized as worthwhile by the public. This article will focus upon the academic and pedagogical challenges that the project members faced in the process of planning a system to assess and qualify students' literacy in religious traditions. It will argue that religious literacy involves the dynamic ability to put knowledge into practice as well as to reflect continuously upon previously acquired knowledge. "Mining the Archive: Evaluating and Improving a Course"
This classroom note demonstrates that a course may be improved by paying specific attention to Elliot Eisner's distinction between a course's explicit, implicit and null criteria. In an attempt to ground and identify those notoriously slippery curricula, this paper appropriates French philosopher Michel Foucault's concepts of practice, discourse and archival research. Having explored Foucault's understanding of these concepts, the paper analyses the course Communication and Processes within Groups at two distinctive phases in its twenty–year history. The resulting excavation of the course's implicit and null curricula twenty years apart shows that two different sets of facilitators teaching the same explicit curriculum to a very different student body, in vastly changed venues, are working out of two different understandings of what competence in the practice of ministry entails, two very different ministerial education discourses. This paper demonstrates that with students' questions, a teacher's intentional probing and Foucault's framework in hand, it is possible to access and articulate a course's hidden curricula. In such ways, the practice of mining the archive offers an imaginative way of both evaluating and improving a course that has been taught for many years. "The Question Bag: An Active Learning Strategy"
TTR Teaching Tactic: allowing students to establish parts of the curriculum of a course. What is the relationship between the academic knowledge of the guild and the formation of students in the classroom? This Forum gathers four essays originally presented at a Special Topics Session at the 2009 conference of the American Academy of Religion (Atlanta, Georgia), with a brief introductory essay by Fred Glennon explaining the genesis of the panel. Douglas Jacobsen and Rhonda Hustedt Jacobsen clarify some of the issues at stake in undergraduate liberal arts classrooms by distinguishing between four dimensions of what they refer to as “the (in)formation teaching matrix: institutional context, course content, faculty roles, and student outcomes. John Thatamanil argues that all learning necessarily presupposes formation. Amanda Porterfield argues against using the word “formation” because it complicates and undermines her teaching goals to historicize religion and narratives about it through open-ended inquiry. And, finally, Mary Elizabeth Moore explores the interactive processes linking formation, information, reformation, and transformation. "A Profound Unknowing: The Challenge of Religion in the Liberal Education of World Citizens"
"Wading Through the Quagmire of Religious History"
How should we teach religious history? What is the impact of our methodology on what, and on how, our students learn? Is there a methodology that cultivates an awareness of the multiculturalism and the need for deeper social interaction that characterizes many of our classrooms? This essay proposes and briefly explores the potential value of empathetic engagement as a pedagogical tool in response to these concerns. A specific application of empathetic engagement is made to teaching and learning about the history of American Catholicism. Henry, Douglas V., author, ed. ; and Beaty, Michael R., ed. "Caring about More: An Integrative Capstone Course Connecting Religious Studies with General Education"
This paper describes and analyzes an "Integrating Seminar" capstone course for undergraduate religious studies majors, which has the following goals for student learning: (1) to reflect on the cumulative achievement of their studies of religion; (2) to take stock of their learning in liberal studies coursework; and (3) to explore the connections between these specialized and general learning experiences. Readings provided by the instructor and the students and discussions around them lead toward a final paper on this question: "In the context of becoming an educated person, what is religion, how do you know, and why do you care?" The paper concludes with some reflections on ways to better prepare students for this kind of integrated thinking through advising and ongoing colloquia. What impact does a college education have on students' careers and personal lives after they graduate? Do they consider themselves well prepared for the complexities, demands and ambiguities of contemporary society? What can we learn from their stories to improve the college learning experience? 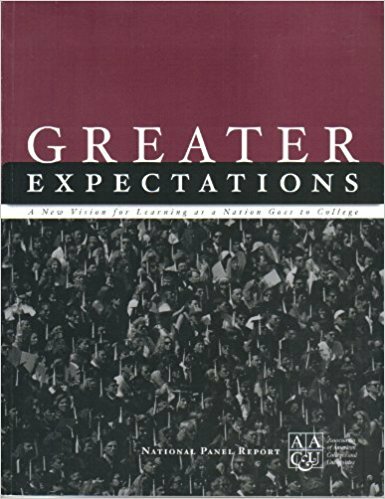 This ground-breaking book extends a unique longitudinal study of 101 male and female college students started by the author in 1986, and reported in her highly successful and influential book, Knowing and Reasoning in College (1992). This book follows the journeys of the young adults remaining in the study -- drawing on over 300 new interviews -- from graduation to their early thirties. 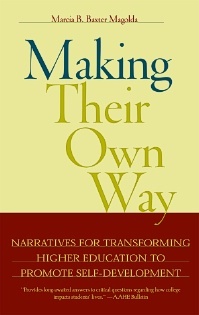 Through the students' own stories, Marcia Baxter Magolda allows us to follow their journeys to an internally-authored sense of identity and belief systems, and in many cases to witness the development of the complex ways of making meaning that are needed for fulfilling participation in modern society. From her observation and analysis, she derives a new framework for higher education to achieve better stewarding and fostering of its students' crucial journeys of transformation. She develops the concept of providing "good company" -- through the shaping of curriculum and co-curriculum, advising, leadership opportunities, campus work settings, collaboration, diversity and community building -- that young adults need along the way to finding and to taking their place as citizens and leaders in the twenty-first century. "Teaching Buddhism in the Postmodern University: Understanding, Critique, Evaluation"
A contemporary liberal education in the humanities and social sciences should introduce students to the serious exploration of various kinds of worlds that human beings articulate and within which they live. Teachers in Buddhist studies can make a significant contribution by offering courses that focus attention on distinctively Buddhist worlds that are directly relevant to postmodern interests and concerns. These courses should also be designed to empower students with the kind of interpretive skills that are needed in a postmodern environment to generate viable modes of sympathetic understanding, convincing forms of critical analysis, and the capacity to formulate and defend responsible personal and social judgments. This article is a revised version of the keynote lecture given at a McGill University conference on "Teaching Buddhism: The State of the Art," October 8–10, 1999. "Critiquing Borders: Teaching About Religions in a Postcolonial World"
In a postcolonial environment, our students will encounter multiple representations and diverse followers of various religions outside the classroom. Students need to think critically about the representations of all religions and recognize the humanity of all people. Too often, students leave courses discussing one or more world religions with an idealized view of other religions that draws strict boundaries around the components of each religion. Bringing postcolonial thought into introductory and survey courses highlights the diversity within each lived religion and encourages students to critique those strict borders and all representation of religions. Based on continuing experiments with critical theory in undergraduate classes, the six strategies presented here use the diversity of lived religions to promote critical analysis of representations of religions. These strategies move beyond the rejection of common representations by introducing set theory as an alternative framework that students can use to theorize about the complexity within religions. "Teaching Religion Religiously: A Dialogue"
Two theologians teaching religion at the same college engage in a dialogue about differences in their understandings of teaching religion in order to explore serious pedagogical and theological issues. Their reflections on their teaching touch on issues of learning goals, institutional identity, student freedom, faculty self-revelation, and the liberal arts that most teachers of religion face. Along the way, they explore the relation of pedagogy to theological topics like grace and ecclesiology. 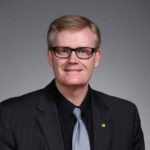 We invite readers to join the conversation begun in this article by engaging Webb, Placher, and one another through the public discussion list we've created for this article on the Wabash Center Discussion Forum at http://ntweb.wabash.edu/wcdiscus/. "What Does New Haven Have to Do with Lubbock? Texts, Techniques, and Sociology"
This note examines some pedagogical strategies for the formation of students who read the Bible both confessionally and critically. Some students in both church-related and secular colleges and universities enter courses with confessional views of the Bible that inspire a literal interpretation of the text, what the author calls a flat reading. Teachers struggle to lead students to a more nuanced view of the text in a way that is both sensitive to the students' development and academically responsible. The author indicates how he approaches this challenge through: (1) a discussion of texts that have been used to enable students to see the nature of the biblical text and to transform their understanding of it; (2) a description of techniques and exercises that work toward the same goal; and (3) reflection on the application of sociological research on group change in the transformation of individuals. Creating effective and engaging learning experiences has too often been viewed as an uninspiring task. Shouldn’t this be where our passion as teachers comes through? Could it be we are focusing on a limited aspect of learning? An early You Tube mix of submissions for "The Visions of Students Today," a project by cultural anthropologist Michael Wesch. Learners express apathy and discouragement concerning their education, but also strong desire for empowering experiences of learning as creating, exploring, risking. Scholars have identified the many stories in the Bible that are oppressive to women or other minoritized groups. It is remarkable how common it is that North American undergraduate students remain blind to the oppression that is depicted and that is too often the result of commonly accepted interpretations of these texts. Three brief essays collected here, originally presented as part of a panel at the Society of Biblical Literature annual meeting (Atlanta, 2010), present various teaching strategies for exposing the oppressive elements in the biblical text and showing how the oppression operates (an aspect of ideological criticism). What are good strategies for communicating these hard points to students in a way they can hear them and work with them? Why is this important to do? "Words with Power" for Social Transformation: An Anatomy of Biblical Criticism for Theological Education"
The proliferation of methods of literary criticism in biblical studies raises the question of how to introduce students to the field. This article argues that the work of Northrop Frye is useful for teaching the existential meaning and social impact of the Bible. The first section introduces relevant aspects of Frye's literary theory. The second presents the author's teaching as a case study. The third section concludes with implications for a philosophy of theological education. "The Familiar Made Strange: An Orientation to Biblical Study in Vancouver"
The paper describes an orientation to teaching New Testament Studies at Vancouver School of Theology, a theologically liberal school in the context of Vancouver, Canada – paradoxically one of the most secular and multi-religious cities in the world. Guided by Denise Levertov's poem, "Overland to the Islands," it explores the promises and challenges of biblical study grounded in the material reality of the world, amidst older students who bear the marks of secularity, who are impatient with traditional orthodoxies, and who long more for life before the grave than after it. Adopting ideas from Roland Barthes, Paul Ricoeur, and Julia Kristeva, it explores teaching the Bible in a way that promotes the polyvalence, strangeness, and irreducibility of biblical texts, in order to move students away from exegetical and hermeneutical theories content with recovering authorial intent and reconstructing historical origins as the primary tasks of biblical study. The paper describes a model of teaching that celebrates the materiality of the New Testament together with its textual, social, theological, and historical complexity, as well as a tradition-constituted means of apprehending the world, and which treasures students as living texts who in the course of interpretation awaken ever-fresh meanings relevant to their own communal and personal identities. "Learning to Read the Bible with Desire: Teaching the Eros of Exegesis in the Theological Classroom"
The article begins with two brief theoretical descriptions of a pedagogy of desire vis-à-vis the Christian Bible. The first of these is a poem; the second summarizes the conversation constituted by four quite different books: the Confessions by Augustine of Hippo, Freud & Philosophy by Paul Ricoeur, Pedagogy of the Oppressed by Paulo Freire, and The Ethnography of Reading edited by Jonathan Boyarin. There follows, then, a case in point: an account of my most recent effort to teach the eros of exegesis at Emmanuel College (Toronto), using the Song of Songs. This account includes discussion of the (pre)conception(s) of the (biblical) text that inform(s) this undertaking and of the practice of communal reading as a specific type of bodily activity and social experience. In conclusion, the question of evaluation is addressed. How does one learn to love – when, by, in, with, and under – reading the Bible? "Faith in the Classroom: The Perspective of a Pastor Called to College Teaching"
Can one uphold a call from an ecclesiastical body while teaching in a college classroom? This paper will argue that the dual roles of pastor and professor can be integrated by the adoption of faith development as a learning goal. This goal seems to stand at odds with three important aspects of academic teaching: the demographic reality of religious pluralism, the ethical requirement to preserve student autonomy, and the overarching goal of a university education to promote critical thinking. My argument will be that, far from violating these three areas, faith development as a broad learning goal can actually provide a valuable deepening of pluralism, autonomy, and critical thought in the educational experience of students. The method of exploration will be autobiographical. I will show how it is that in my dual roles as an ELCA pastor called to a faculty post I articulate and use faith development as an overarching learning goal in the context of (1) a theological pedagogy based on an interfaith logos theology, (2) a value-laden pedagogy vis-à-vis consumerist self-formation, and (3) an adaptation of stages of faith development to the classroom. Cornell, Collin; and LeMon, Joel M.
This study identifies the dominant modes of biblical interpretation being taught in introductory Bible courses through a qualitative analysis of course syllabi from three institutional contexts: evangelical Christian colleges, private colleges, and public universities. Despite a proliferation of methods and scholarly approaches to the Bible, this study reveals that historical-critical approaches continue to predominate in pedagogical contexts, especially private colleges and public universities. In Christian colleges, theological approaches appear more frequently, usually alongside historical criticism and rarely supplanting it. The study also shows that teachers have been deploying social scientific and ideological approaches with increasing frequency over the past decade. Additionally, the study tracked instruments of student assessment in these courses. Public universities showed a particularly high level of pedagogical conservatism in this regard, while Christian colleges exhibit the greatest diversity with respect to course assignments and evaluations. See also “Response to ‘How We Teach Introductory Bible Courses’” by Caryn A. Reeder, Tat-siong Benny Liew, Jane S. Webster, Alicia J. Batten, and Chris Frilingos, published in this issue of the journal. The complete data set is included in an extended Appendix at the end of the article, and is also available electronically on the “Supporting Information” tab of the article's webpage and at the Wabash Center (https://www.wabashcenter.wabash.edu/pdfs/AppendixCornellandLeMon.pdf). The essays collected in this manuscript respond to “How We Teach Introductory Bible Courses: A Comparative and Historical Sampling” by Collin Cornell and Joel M. LeMon, published in this issue of the journal. An undergraduate liberal arts education can help students be not simply shaped by tradition but also shapers of tradition. Specifically, undergraduate theological education, aimed at ministry preparation in a liberal arts setting, can seek to graduate students who are responsible shapers of the traditions that shape them, that is, who are tradents. The work of a tradent involves active engagement that requires skills and capacities well beyond simply passing on the past formulations of a tradition. The pedagogical question, then, is how to engage in undergraduate theological education if this image of the tradent is what we have in mind for our students. Three aspects of this image can serve as pervasive or recurrent themes across the structure of a major or program. One aspect is the interpretive nature of the tradent's work, a second is facility with traditions, and a third is the creative, constructive work of thinking theologically. Whatever particular traditions characterize a department's context, the image of students as tradents can help focus pedagogical reflection on the department's work: teaching students as shapers of the traditions that shape them. 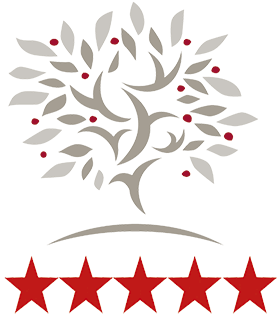 Diverse teams of faculty and other academic and student affairs professionals from a wide range of institutions has drafted and revised institutional-level rubrics (and related materials) to correspond with the AAC&U "Essential Learning Outcomes." Each VALUE rubric contains the most broadly shared criteria or core characteristics considered to be critical for judging the quality of student work in a particular outcome area, including: intellectual/practical skills (such as critical thinking and communication), personal and social responsibility (such as civic engagement and ethical reasoning), and integrative and applied learning. "Teaching the Bible in the Context of General Education"
Three conceptions of general education developed under the titles 'general,' 'generalist,' and 'generalizing' are matched with appropriate strategies for teaching the Bible. These provide the basis for two points relevant to teaching the Bible in colleges and universities: first, that the prime object of attention is not the Bible, but rather a corporate agreement regarding an educational project; and second, that the ways in which the Bible might be taught will vary, appropriately, according to the ways in which that educational enterprise is understood. A corollary is stated: teachers of the Bible need to be as informed about research in teaching as they are in biblical research. Today's colleges and universities face increasing pressure to develop programs and curricula that will teach students how to handle life's unexpected challenges and events. For educators and policymakers, this urgency will only grow as new global trends emerge and social expectations change. This timely book explores what it means for learners to transform themselves and for educators to foster essential skills for learning, leading, teamwork, and adapting with integrity in college and beyond. 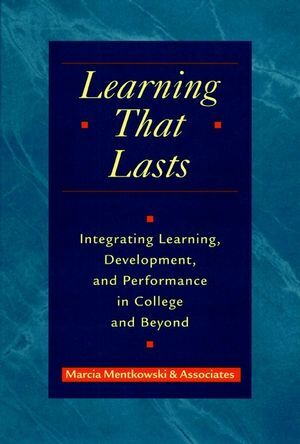 The authors begin by defining "learning that lasts" as the successful integration of learning, development, and performance. Drawing on two decades of longitudinal studies of student learning in the highly acclaimed curriculum at Alverno College and on leading educational theories, Marcia Mentkowski and her associates set forth a theory of deep and durable learning that includes practical strategies for enabling a wide range of students to cultivate integrative and expansive capabilities across a lifetime. They present concrete suggestions on the ways that faculty and academic staff can work together to forge effective curricula, design innovative programs, implement key institutional goals, and renegotiate the college culture. They analyze compelling research results, collaborative inquiry by consortia of institutions, and twenty-five years of experience to illuminate what educators and administrators must achieve so that increasingly varied learners can realize their goals and potential. Transforming the College Culture Toward Learning That Lasts. "Should We Be Teaching the Historical Critical Method?" This manuscript is an edited transcript of a panel discussion held at a Society of Biblical Literature conference (Boston, Massachusetts, November 22 to 24, 2008). Alice Hunt begins the discussion by summarizing the content and significance of a new book by Dale Martin, The Pedagogy of The Bible (Westminster John Knox Press, 2008) in which he argues that biblical studies in seminaries and divinity schools give too much emphasis to teaching the historical critical method and not enough to preparing students for ministry by teaching them to be self-reflective practioners of the improvisational skills of interpreting scripture. Then a panel of bible scholars, including the author, conduct a wide-ranging discussion that raises questions about how biblical studies might better prepare students for ministry, as well as the proper role and appropriate pedagogies for introducing biblical studies in the undergraduate liberal arts curriculum. Stephen Prothero's Religious Literacy makes a strong case that minimal religious literacy is an essential requirement for contemporary U. S. citizens. He argues further that high schools and colleges should offer required courses in the study of religion in order to help students reach that baseline literacy. Beyond the general recommendation that such courses focus on biblical literacy and the history of Christianity, however, Prothero does not sketch out his proposal for teaching religious literacy. This essay argues that in addition to providing factual knowledge, teaching for religious literacy needs to involve sustained attention to how religious people use that factual information to orient themselves in the world, express their individual and group self-understanding, and give their lives direction and meaning. Such attention to the dynamics of religious life can also help students understand why human beings have persisted in this mode of behavior. "For What Should Theological Colleges Educate? A Systematic Investigation of Ministry Education Perceptions and Priorities"
The present study sought to investigate the perceptions of 300 ministers, 85 recent graduates from theological colleges, and 954 church members regarding (a) the effectiveness of ministry education, (b) priorities for ministry education, and (c) the acquired competencies of ministers. Participants were surveyed using the Inventory of Ministry Education Perceptions and Priorities (IMEPP), which displayed good validity and reliability in the study. Results of the study indicate that participants were largely satisfied with the effectiveness of ministry education and the acquired competence of ministers. However, on the whole, ministers and recent graduates were less satisfied with their ministry education and acquired competence than were church members. The study also identified significant differences between ministers, recent graduates and church members with regard to the priorities they perceived theological colleges should pursue. "Challenging the Objectivist Paradigm: Teaching Biblical Theology with J.R.R. Tolkien, C.S. Lewis, and Guillermo del Toro"
The dissimilarity that exists between the historical and cultural situation of North American college students and the world described by the biblical authors poses a problem for theological and religious education. While the biblical authors tell fantastic stories of miracle and magic, the scientific and technological paradigm prevalent in western culture emphasizes the gathering of objective facts in the name of efficiency and pragmatism. Theological education tends to respond to this situation by embracing either a program of historical criticism or a form of Biblicism, both of which reinforce an objectivist approach to education. What is needed in theological education is an approach that "re-mythologizes" the Bible, enabling students to hear the theological message of the text addressed to their cultural and historical situation. One way this approach can be encouraged is through the teaching of the biblical text in conversation with the contemporary stories found in popular culture. The developer of the University of Mary (Washington) project "A Domain of One's Own," explains the program’s innovative and expansive understanding of student e-portfolios in a TEDx talk. "Mahatma Gandhi and Character Education in Non-Violence: Its Relevance in Religious Studies Today"
This essay presents educational principles of Mahatma Gandhi, specifically principles of character education, as a model for strengthening non-violence in students. Its major concern is to show that Gandhi's ideal of non-violent character education is important for university teaching in disciplines including religious studies, and that Gandhi offers methods for fostering non-violent character, namely the teaching of world religions, service learning, and setting an example. The effectiveness of Gandhi's views, moreover, finds some support in contemporary teaching practices, including my own experiences in the classroom. Information, web links, and videos explaining "A Domain of One's Own," the University of Mary (Washington) initiative whereby students craft their own web presence into a portfolio that they control and can take with them after graduating. Emory College of Arts and Sciences describes its rollout of its version of "A Domain of One's Own," a University of Mary (Washington) initiative whereby students craft their own web presence into a portfolio that they control and can take with them after graduating. This ECAS page includes a description of the program, and links to extensive documentation for faculty, students, and support staff. In October 2008 The American Academy of Religion published the findings of an eighteen month study (conducted with funding from the Teagle Foundation) on “The Religious Studies Major in a Post–9/11World: New Challenges, New Opportunities.” Re-published here, this AAR-Teagle White Paper provides the opportunity for four respondents to raise issues and questions about the teaching of religion in their own institutional contexts. First, Jane Webster describes how the White Paper's “five characteristics of the religion major” find expression in her biblical literature course. Then James Buckley suggests some of the general level teaching issues provoked by the study and analyzes how well the White Paper aligns with how the teaching of religion is conceived in his Catholic university context. Tim Jensen draws comparisons between the White Paper and the higher education structures and goals from his university context in Denmark, raising questions about what motivates students to major in religious studies, the “utility” of a religious studies major, and whether students' religious and spiritual concerns ought to enter the classroom. And finally Stacey Floyd-Thomas finds surprising similarities between the state of the religion major and the various crises facing contemporary North American theological education. A growing interest in the communication to students of the mission and identity of a higher education institution prompted this study about the presence of Catholic, Jesuit values in the introductory religious studies course at a faith-based university. To conduct this study a survey instrument was developed, piloted, further refined, and then administered again to about four hundred and fifty students. The study's results showed that the introductory course had a positive effect on the majority of students surveyed, namely, those who had no Catholic schooling or only had a Catholic elementary school education. Statistically significant advances in several areas of knowledge about Catholic teachings endorsed by Catholic bishops and the pope occurred. Although less extensive, knowledge of Jesuit values also advanced in the course. In the undergraduate classroom, tabletop games can aid both teaching and learning – especially when accompanied by debriefing exercises following gameplay. In particular, tabletop games enable undergraduate learners to practice the 21st century skills of collaboration, communication, and critical thinking. This qualitative study examines three cases from the disciplines of practical theology, systematic theology, and history, utilizing the methods of classroom video recordings, written assessments from students and professors, and student debriefing exercises. In this study, undergraduate students (n = 46) and undergraduate professors (n = 3) reflect upon and self‐report their experience playing tabletop games in the classroom. Students and professors report that tabletop gameplay appears to intensify active learning, classroom engagement, and student motivation – a powerful blend for the retention of course content. Webster, Jame S.; Runions, Erin; Gallagher, Eugene V.; Lopez, Davina C.; McGinn, Sheila E. Penner, Todd C. and Howell, David B. This is the thoroughly revised and updated second edition of the best-selling book Exploring Leadership. 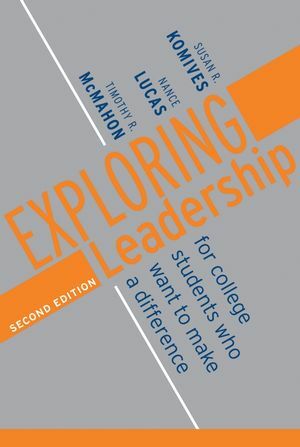 The book is designed to help college students understand that they are capable of being effective leaders and to guide them in developing their leadership potential. Exploring Leadership incorporates new insights and material developed in the course of the authors' work in the field. The second edition contains expanded and new chapters and also includes the relational leadership model, uses a more global context and examples that relate to a wide variety of disciplines, contains a new section which emphasizes ways to work to accomplish change, and concludes with concrete strategies for activism. "To Teach Them to See": Teaching Christian Theology in Material Things"
Teachers of theology or religious studies readily seek to open their students to the interpretation of theological texts. Do they share a similar readiness to open students to the interpretation of religious symbols and artifacts, the material cultures of religious faiths? Although theological studies have preferred the abstract concept over the material object, any proper understanding of religious faith must admit some form of direct encounter with the constellation of material symbols surrounding that faith. Teaching students to "read" the material symbols of faith does not do away with the need to help them read and interpret the written word, but supplements and deepens humane, scholarly reflection on religious faith. Helping students to see, to interpret what they see, and to re-view their understanding of the religious symbol or artifact amounts to teaching a visual theology; a helpful and necessary challenge for the teacher of theology or religious studies. "Enhancing Student Learning: Intellectual, Social, and Emotional Integration"
Argues that the time is ripe for an institutional reform movement to focus on holistic learning: What does research say about the relationship among the intellectual, social, and emotional elements of student learning? What can individual faculty, student affairs professionals, and institutions more generally do to enhance holistic learning? "The Trouble With Learning Outcomes"
Recent decades have seen an increasing stress on the need to monitor and manage educators, and hold them to account. This article argues that, while learning outcomes can be valuable if properly used, they have been misappropriated and adopted widely at all levels within the education system to facilitate the managerial process. This has led to their distortion. The claim that they can be made precise by being written with a prescribed vocabulary of special descriptors so as to serve as objective, measurable devices for monitoring performance, is fundamentally mistaken, and they may be damaging to education when used in this way. After a brief sketch of the background to the notion of learning outcomes, arguments are presented to show their vacuity and uselessness when misused in this way, and explanations of their inadequacies are offered.